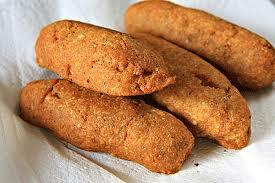 Alcapurrias (Stuffed Yucca Fritters) - Tienditadepuertorico.com - Buy Puertorican Food Here!! Add Sazon, onion, garlic, tomato sauce, and adobo to grated yuca. Preheat olive oil in non stick pan. Add sofrito, oregano, cumin, black pepper, bay leaf, tomato sauce, and capers. In the center of the masa place 2 tablespoons of meat filling. Fold banana leaf over so both sides of masa come together. Preheat oil for frying over medium heat, preferably in non stick pan. Slowly slide contents of banana leaf into hot oil. *Pregrated yuca can be purchased from the frozen vegetable aisle in your local market. liquid again until grated yuca is compact.